LOS ANGELES — Los Angeles Sparks forward Candace Parker was ejected for arguing with the referees at the end of the Sparks’ 84-79 loss to the Atlanta Dream on Tuesday night at Staples Center. Parker had 15 points and 10 rebounds in her first game back after missing the last seven weeks because of a torn lateral meniscus in her right knee, but her return ended on a sour note as she became visibly upset and gestured wildly at official Felicia Grinter after the referees didn’t call a foul on a wild sequence near the end of the close game in which Parker believed both she and her teammates were fouled. She was called for two technical fouls and ejected from the game with 0.3 seconds left. Dream forward Angel McCoughtry converted the technical foul shots to give the Dream a five-point win. Though the reffing in the WNBA has improved vastly from a decade ago, I can understand why a player would flip out on an idiot call. What? The Lynx lost again? Not only did they lose, they got their butts kicked in Connecticut, 108-79. 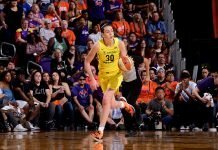 Diana Taurasi’s last-second heroics put the Mercury over the Storm, 81-79, and prevented Phoenix from suffering a tenth consecutive loss to Seattle. In the Liberty-Mystics matchup, it was Cappie Pondexter who was the hero for New York. They won 69-66. The Fever held off the Silver Stars for the 65-63 win.